Dear Brothers and Sisters, good evening! I am grateful to all of you for your warm welcome. It is good to be here! It is good to celebrate, for celebration makes us more human and more Christian. It also helps us to share the joy of knowing that Jesus loves us, he accompanies us on our journey of life, and each day he draws us closer to himself. In any family celebration, everyone’s presence is felt: fathers, mothers, grandparents, grandchildren, uncles and aunts, cousins, those who cannot come and those who live too far away. Today in Dublin we are gathered for a family celebration of thanksgiving to God for who we are: one family in Christ, spread throughout the world. The Church is the family of God’s children. A family in which we rejoice with those who are rejoicing, and weep with those who grieve or feel knocked down by life. A family in which we care for everyone, for God our Father has made all of us his children in Baptism. That is one reason why I keep encouraging parents to baptize their children as soon as possible, so that they can become part of this great family of God. We need to invite everyone to the party! You, dear families, are the vast majority of the People of God. What would the Church look like without you? It was to help us recognize the beauty and importance of family, with its lights and shadows that I wrote my Exhortation “Amoris Laetitia” on the joy of love, and wanted the theme of this World Meeting of Families to be “The Gospel of the Family, Joy for the World”. God wants every family to be a beacon of the joy of his love in our world. What does this mean? It means that we, who have encountered God’s saving love, try, with or without words, to express it in little acts of kindness in our daily routine and in the most hidden moments of our day. That is what holiness is all about. I like to speak of the saints “next door”, all those ordinary people who reflect God’s presence in the life and history of our world (cf. “Gaudete et Exsultate”, 6-7). The vocation to love and to holiness is not something reserved for a privileged few. Even now, if we have eyes to see, we can see it being lived out all around us. It is silently present in the heart of all those families that offer love, forgiveness and mercy when they see the need, and do so quietly, without great fanfare. The Gospel of the family is truly joy for the world, since there, in our families, Jesus can always be found, dwelling in simplicity and poverty as he did in the home of the Holy Family of Nazareth. Christian marriage and family life are only seen in all their beauty and attractiveness if they are anchored in the love of God, who created us in his own image, so that we might give him glory as icons of his love and holiness in the world. Fathers and mothers, grandfathers and grandmothers, children and grandchildren: all of us are called to find, in the family, our fulfilment in love. God’s grace helps us daily to live as one in mind and heart. Even daughters-in-law and mothers-in-law! No one said this would be easy. It is like making tea: it is easy to bring the water to a boil, but a good cup of tea takes time and patience; it needs to brew! So it is that each day Jesus warms us with his love and lets it penetrate our whole being. From the treasury of his Sacred Heart, he offers us the grace we need to heal our infirmities and to open our minds and hearts to hear, understand and forgive one another. We just heard the testimonies of Felicité, Isaac and Ghislain, who are from Burkina Faso. They told us a moving story of forgiveness in the family. The poet says that “to err is human, to forgive divine”. And that is true: forgiveness is a special gift from God that heals our brokenness and draws us closer to one another and to him. Small and simple acts of forgiveness, renewed each day, are the foundation upon which a solid Christian family life is built. They force us to overcome our pride, aloofness and embarrassment, and to make peace. It is true that I like to say that in our families we need to learn three words: “sorry”, “please” and “thank you”. When you quarrel at home, be sure that before going to bed you apologize and say you are sorry. Even if the argument tempts you to sleep in another room, alone and apart, just knock on the door and say: “Please, can I come in?” All it takes is a look, a kiss, a soft word… and everything is back to the way it was! I say this because when families do this, they survive. There is no such thing as a perfect family; without the practice of forgiveness, families can grow sick and gradually collapse. To “forgive” means to “give” something of yourself. Jesus always forgives us. 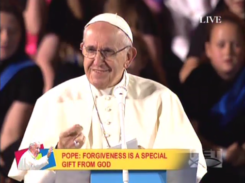 By the power of his forgiveness, we too can forgive others, if we really want to. Isn’t that what we pray for, when we say the Our Father? Children learn to forgive when they see their parents forgiving one another. If we understand this, we can appreciate the grandeur of Jesus’ teaching about fidelity in marriage. Far from a cold legal obligation, it is above all a powerful promise of God’s own fidelity to his word and his unfailing grace. Christ died for us so that we, in turn, might forgive and be reconciled with one another. In this way, as individuals and as families, we can know the truth of Saint Paul’s words that, when all else passes away, “love never ends”” (1 Cor 13:8). Thank you Nisha and Ted, for your testimony from India, where you are teaching your children how to be a true family. You have helped us to understand that social media are not necessarily a problem for families, but can also serve to build a “web” of friendships, solidarity and mutual support. Families can connect through the internet and draw nourishment from it. Social media can be beneficial if used with moderation and prudence. For example, all of you gathered for this World Meeting of Families have formed a spiritual network, a web of friendship; social media can help you to maintain this connection and expand it to even more families throughout the world. It is important, though, that these media never become a threat to the real web of flesh and blood relationships by imprisoning us in a virtual reality and isolating us from the very relationships that challenge us to grow to our full potential in communion with others. Perhaps Ted and Nisha’s story will help all families to question whether they need to cut down on the time they spend with technology, and to spend more quality time with one another and with God. We have heard from Enass and Sarmaad how a family’s love and faith can be a source of strength and peace even amid the violence and destruction caused by war and persecution. Their story reminds us of the tragic situations endured daily by so many families forced to flee their homes in search of security and peace. But they also show us how, starting from the family, and thanks to the solidarity shown by so many other families, lives can be rebuilt and hope born anew. We saw this support in the video of Rammy and his brother Meelad, where Rammy expressed his deep gratitude for the encouragement and help their family received from so many other Christian families worldwide, who made it possible for them to return to their village. In every society, families generate peace, because they teach the virtues of love, acceptance and forgiveness that are the best antidote to the hatred, prejudice and vengeance that can poison the life of individuals and communities. As a good Irish priest taught us, “the family that prays together, stays together” and radiates peace. In a special way, such a family can be a support for other families that do not live in peace. Following the death of Father Ganni, Enass, Sarmaad and their family chose forgiveness and reconciliation over hatred and resentment. They saw, in the light of the cross, that evil can only be fought by good, and hatred overcome only by forgiveness. Almost incredibly, they were able to find peace in the love of Christ, a love that makes all things new. Tonight they share that peace with us. The love of Christ that renews all things is what makes possible marriage and a conjugal love marked by fidelity, indissolubility, unity and openness to life. It is what I wanted to celebrate in the fourth chapter of Amoris Laetitia. We see this love in Mary and Damian and their family of ten children. Thank you for your testimony and for your witness of love and faith! You experienced the power of God’s love to change your lives completely and to bless you with the joy of a beautiful family. You told us that the key to your family life is truthfulness. From your story, we see how important it is to keep going back to the source of the truth and the love that can change our lives: Jesus, who began his public ministry at a wedding feast. There, in Cana, he changed water into a new and sweet wine that kept the joyful celebration going strong. So it is with conjugal love. The new wine begins to ferment during the time of engagement, which is necessary but fleeting, and matures throughout marriage in a mutual self-giving that enables spouses to become, from two, “one flesh”. And to open their hearts, in turn, to all those in need of love, especially the lonely, the abandoned, the weak and vulnerable so often discarded by our throw-away culture. Families everywhere are challenged to keep growing, to keep moving forward, even amid difficulties and limitations, just as past generations did. All of us are part of a great chain of families stretching back to the beginning of time. Our families are a treasury of living memory, as children become parents and grandparents in turn. From them we receive our identity, our values and our faith. We see this in Aldo and Marissa, who have been married for over fifty years. Their marriage is a monument to love and fidelity! Their grandchildren keep them young; their house is filled with laughter, happiness and dancing. Their love for one another is a gift from God, and it is a gift that they are joyfully passing on to their children and grandchildren. A society that does not value grandparents is a society that has no future. A Church that is not mindful of the covenant between generations will end up lacking the thing that really matters, which is love. Our grandparents teach us the meaning of conjugal and parental love. They themselves grew up in a family and experienced the love of sons and daughters, brothers and sisters. So they are a treasury of experience and wisdom for the new generation. It is a big mistake not to ask the elderly about their experience, or to think that talking to them is a waste of time. Here I would like to thank Missy for her words of witness. She told us that, among travellers, the family has always been a source of strength and solidarity. Her witness reminds us that, in God’s house, there is a place at table for everyone. No one is to be excluded; our love and care must extend to all. I know it is late and you are tired! But let me say one last thing to all of you. As families, you are the hope of the Church and of the world! God, Father, Son and Holy Spirit, created mankind in his image to share in his love, to be a family of families, and to enjoy the peace that he alone can give. By your witness to the Gospel, you can help God’s dream to come true. You can help to draw all God’s children closer together, so that they can grow in unity and learn what it is for the entire world to live in peace as one great family. For this reason, I wanted to give each of you a copy of Amoris Laetitia, which I wrote as a kind of roadmap for living joyfully the Gospel of the family. May Mary our Mother, Queen of the Family and Queen of Peace, sustain all of you in your journey of life, love and happiness! 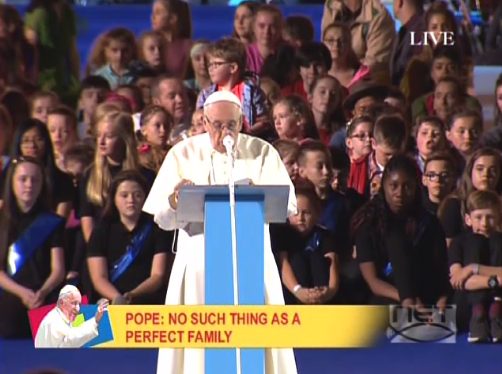 And now, at the conclusion of our evening together, we will recite the prayer for this World Meeting of Families. Good night and rest well! See you tomorrow!